Design a simple identity uniting all the various departments that comprise the Ravensbourne Employability Office. A simple logotype treatment flexible enough to work across a range of products using a colour scheme of black and yellow, informed by guidelines to aid dyslexic readers, which make up at least 40% of Ravensbourne’s student population. Working with the Ravensbourne Employability Department, I was commissioned to design some very simple branding, that would encompass all of their departments (employability, student finance, well-being, counselling, language support, etc.) under one umbrella-mark. The decision to design it as black text on a yellow background was based on guidelines for dyslexic readers; from which as many as 40% of the university’s students suffer. It needed to also be unique enough that it stood apart from the Ravensbourne branding, but retained the university typeface. 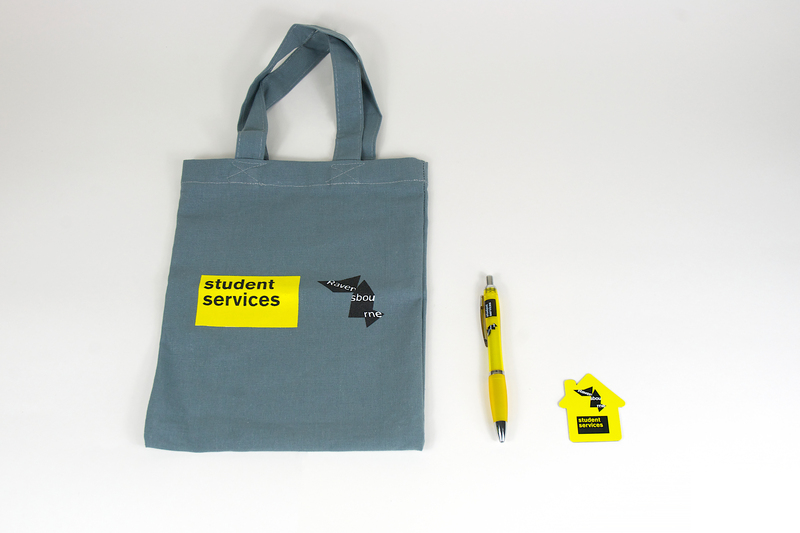 I was required to design various postcards, tote bags, banners, pens and posters all for the purpose of advertising for the department around the university building.